Following the release of Fa Fa Fa, Fire and Ice Island and Da Hong Bao last year, God of Cookery marks the first slot release of 2018 for developer Genesis. This slot looks as good as it plays. The presentation here is admirable, with the God of Cookery always joining you by the reels to cheer you on and reward your lucky spins. The reels themselves have a 5×4 layout giving you a lot more space than other slots. Genesis has managed to pack an impressive 100 paylines onto the reels, pushing the RTP of this game to a very high 97.1%. The wager limits cover high and low rollers, starting at 0.01 and topping out at 200 per spin. As the name says, you will be spinning the reels with a master chef so it makes sense that the reel icons are some of the most succulent dishes you have ever laid eyes on. From Lobster Thermador to fish, dumplings and other delicacies, they are all on the menu in Good of Cookery. Rounding out the standard reel symbols, you will find Genesis has added a scatter symbol and a wild icon. There is no better touch to a chef than a sense of surprise. The God of Cookery has that very sense and he shares it with players of this slot. During the game, you will see stacked symbols appear featuring covered dishes. These dishes can spontaneously uncover to reveal a set of matched symbols. The scatter symbol is needed to activate the free spins feature. The middle three reels need to feature 3 scatters to trigger the 5 free spins feature. If you trigger it with more scatters, you get 5 extra spins for every scatter over and above 3. Once the feature kicks off you will first need to spin a special wheel of fortune. This wheel will determine what icon will replace the special Mystery Dish icons during the free spins round. 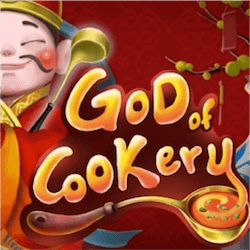 If you are in the mood for a slot a little different from the competition, God of Cookery is an excellent choice. The appealing graphics are a great draw and the solid features make this a rewarding experience. Genesis is really producing some wonderful content and they have attacked 2018 with all their strength. Hopefully God of Cookery shows what we can expect from the developer this year. Sophie Lise has spent a long time enjoying the sights and sounds that Canadian casinos have to offer, and has paid particular attention to the slots this country provides access to. She has now opted to share what knowledge and information she has managed to gather along the way, and regularly contributes to CanadianOnlineSlots.net. Her original thinking, honest, straightforward writing style, and uncanny ability to spot the next big thing has earned her many followers, and she enjoys engaging with her audience online. Passionate about casino industry news, Sophie ensures that her readers always know what’s hot and happening.